1. Suppose that the economy IS in a long-run equilibrium. a. Draw a diagram to illustrate the state of the economy. Be sure to show aggregate demand, short run aggregate supply, and long run aggregate supply. b. Now suppose that a stock-market crash causes aggregate demand to fall. Use your diagram to show what happens to output and the price level in the short run. What happens to the unemployment rate? 2. Explain whether each of the following events will increase, decrease, or have no effect on long-run aggregate supply. a. The United States experiences a wave of immigration. b. Congress raises the minimum wage to $10 per hour. c. Intel invents a new and more powerful computer chip. 3. Suppose an economy is in long-run equilibrium. a. Use the model of aggregate demand and aggregate supply to illustrate the initial equilibrium (call it point A). Be sure to include both short-run and long-run aggregate supply. b. The central bank raises the money supply by 5 percent. Use your diagram to show what happens to output and the price level as the economy moves from the initial to the new short-run equilibrium (call it point B). c. Now show the new long-run equilibrium (call it point C). What causes the economy to move from point B to point C? d. According to the sticky-wage theory of aggregate supply, how do nominal wages at point A compare to nominal wages at point B? How do nominal wages at point A compare to nominal wages at point C? 4. In 1939, with the U.S: economy not yet fully recovered from the Great Depression, President Roosevelt proclaimed that Thanksgiving would fall a week earlier than usual so that the shopping period before Christmas would be longer. 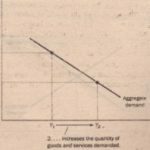 Explain what President Roosevelt might have been trying to achieve, using the model of aggregate demand and aggregate supply. a. The aggregate-demand curve slopes downward because it IS the horizontal sum of the demand curves for individual goods. b. 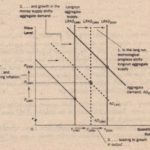 The long-run aggregate-supply curve is vertical because economic forces do not affect long-run aggregate supply. a. How the economy recovers from a recession and returns to its long-run equilibrium without any policy intervention. b. What determines the speed of that recovery. 7. Suppose the Fed expands the money supply, but because the public expects this Fed action, it simultaneously raises its expectation of the price level. What will happen to output and the price level in the short run? Compare this result to the outcome if the Fed expanded the money supply but the public didn’t change its expectation of the price level. 8. Suppose that the economy is currently in a recession. If policymakers take no action; how will the economy change over time? 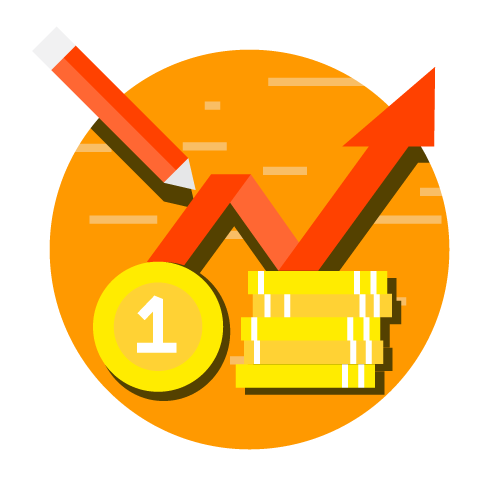 Explain in words and using an aggregate-demand aggregate supply diagram. 9. The economy begins in long-run equilibrium. Then one day, the president appoints a new chairman of the Federal Reserve. This new chairman is well-known for his view that inflation is not a major problem for an economy. a. How would this news affect the price level that people would expect to prevail? b. How would this change in the expected price level affect the nominal wage that workers and firms agree to in their new labor contracts? c. How would this change in the nominal wage affect the profitability of producing goods and services at any given price level? 10. Explain whether each of the following events shifts the short-run aggregate-supply curve, the aggregate-demand curve, both, or neither. For each event that does shift a curve, draw a diagram to illustrate the effect on the economy. a. Household wealth rises as the stock market booms. b, The price of crude oil rises. c. A senes of tornadoes flattens several factories in the Midwest. 11. For each of the following events, explain the short-run and long-run effects on output and the price level, assuming policymakers take no action. a. The stock market declines sharply, reducing consumers’ wealth. b. The federal government increases spending on national defense. c. A technological improvement raises productivity. d. A recession overseas causes foreigners to buy fewer U.S. goods. 12. Suppose that firms become very optimistic about future business conditions and invest heavily in new capital equipment. a. 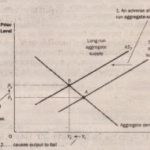 Draw an aggregate-demand/aggregate-supply diagram to show the short-run effect of this optimism on the economy, Label the new levels of prices and real output. Explain in words why the aggregate quantity of output supplied changes. b Now use the diagram from part (a) to show the new long-run equilibrium of the economy. 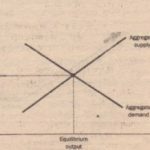 (For now, as swine there is no change in the long-run aggregate-supply curve.) Explain in words why the quantity of output demanded changes between the short run and the long run. 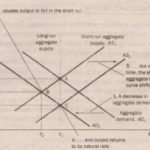 c. How might the invesent boom affect the long-run aggregate-supply curve? Explain. 13. In economy A, all workers agree in advance on the nominal wages that their employers will pay them. In economy B, half of all workers have these nominal wage contracts, while the other half have indexed employment contracts, so their wages rise and fall automatically with the price level. 14. The National Bureau of Economic Research is a nonprofit economic research group that sets the official dates for the beginning and end of recessions in the United States. Go to its website, htn>:www.nber.org, and find information about business cycle dating. Notice that the NBER often uses the term contraction for a recession and the term expansion for the period of growth between recessions. a. What was the U.S. economy’s most recent turning point? Is the U.S economy now in an expansion or a contraction? b. When was the most recent completed contraction? How long was it? By historical standards, was this contraction short or long? c. When was the most recent completed expansion? How long was it? By historical standards, was this expansion short or long?